Can you believe I had never decluttered my makeup until this week? 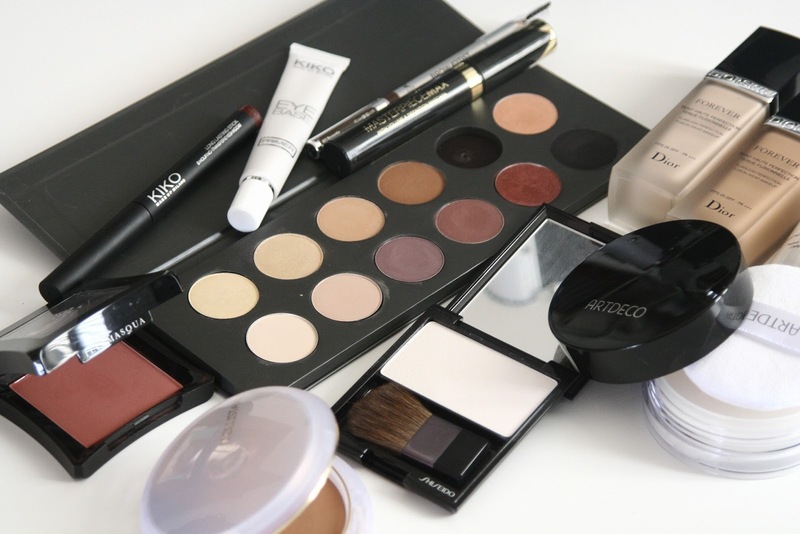 My makeup had never been big enough for me to feel the need to declutter it but I have been using makeup for many years and I had loads of products that were many years old and that I didn't use anymore (for obvious reasons) but I still kept them because... I honestly don't know why. I have this thing where when a product is almost over, I immediately buy another one before it's over and because I like to try new things I usually get a product I hadn't tried before. And then I make me promise to myself that I won't use it until the one I'm currently using is over but then I think "what if the new one isn't good? Then I won't have anything to use until I get something else" knowing that I'll still make it work nonetheless. So my rebellious brain thinks "I'll only use it once to try it out" yeah... sure... "once". I end up ditching the old one if I find the new one better and then I'm left with a bunch of almost finished products. When I realize I'm starting to hoard too many I try using them up and that method has been going well for me... until I get another new one. This week I was just feeling in a decluttering mood so I thought I'd declutter my makeup and also reorganize it and make it easier for me to see the products so that I can use everything I have instead of just using the ones that were easily accessible. If you're also in the mood to declutter your makeup, here are my tips. I'm not a professional but hopefully, I can help. Because products don't actually have an expiration date, you're kind of gonna have to do some math. Every product has a little symbol of an opened circular box with how many months you're supposed to use the product for after you've opened it. Sometimes it can be hard to think of when you've bought a product when you have many or when you don't have a great memory but chances are if you've had a product for way too long, you'll know. Something in your gut will tell you. If you're unsure and it's a product you like and use regularly and it's almost over then you might be able to ignore the expiration date a bit but don't push it, if it changes colour, scent, texture, etc maybe it's time to throw it out. From what I've seen, only powder products have an expiration date of over a year. When it comes to cream and liquid products, if you haven't used it in the past year, throw it out. It's most likely out of date, it's not even the same as it used to be in the beginning texture, colour or finish wise and if you haven't used it in a long time, ask yourself why. If you don't use it and know deep down that you're never gonna use it again, it's time to get rid of it as it's only cluttering up your space. When it comes to powder products, you're gonna have to be a bit more strict. It could be a useful product that you know you'll get wear out of but you just haven't found the time or opportunity to use in the past few months and that's okay but you're gonna have to be strict about it. Don't lie to yourself and don't play tricks or come up with excuses to keep things. The whole point of decluttering your makeup is to get rid of things you don't need. Sometimes we buy products that are similar to ones we already own. We either did it by accident or actually on purpose to maybe compare the two or to always have a back up in case something goes wrong last minute. If you see that you have more than one product that is very similar to another, you're gonna have to pick between them. It'll just be sitting in your makeup drawer, waiting for the day it'll go out of date and you're forced to throw it out. It can be hard to use up or throw away limited edition products, I get it. I've seen limited edition makeup products being sold on ebay for thousands so I get it. But have you thought that if you're not using it and don't want to throw it away either, maybe keeping it alongside the rest of your makeup isn't a good choice? It's just occupying needed space and making your collection look cluttered. You can use these products to decorate your desk or your shelves. If you don't want to have them on display, there's also the idea of keeping them in a separate box or a scrapbook style book with slots big enough for products (like the ones for coin collections), I don't know if it actually exists but you can make one yourself. That way you won't have them cluttering up your makeup while still keeping them for the memories and to show your grandchildren one day! If you spend a lot of money on a product, even if it's bad or doesn't necessarily work for you, you won't want to throw it out. You might've worked very hard to buy that one product but just because it broke the bank, doesn't mean you need to keep it just because of that. You've literally paid for something to be standing there with no absolute use. The solution? Give it to someone who will appreciate it more than you. A family member, a friend, a shelter, etc. Give it away to someone who will actually use it and that way you won't feel so bad about spending money on it because someone else is making use out of it. Some products are only there because we just forgot about them. And maybe they're almost over. And maybe their expiration date is close. If you feel like it's a usable, well-loved product you don't have to throw it away, you can simply use it up. It'll be over in no time and you won't have wasted your money. Once it's over, throw it out and you'll slowly declutter your collection. Decluttering isn't only a good opportunity to throw out the oldies and rediscover the newbies but also to reorganize your makeup. If you feel like your current method isn't that great and it doesn't allow you to get the best out of your makeup then take this opportunity to find a better one. Maybe change up some spaces, move things around, even get new storage if necessary. That's amazing! Thank you so much for stopping by!